The August Steiner watch is an attractive well constructed classy looking watch. I'm very well pleased with the fit of its sturdy band; and the easily read numbers on the face of the watch. This beautiful women's watch presented by August Steiner features a genuine leather strap and eight dazzling diamond markers. With a textured center and radiant sunray finish, the dial is adorned with a knurled edge crown topped with a beaded cap. Dimensions 4.0 In. X 4.0 In. X 3.0 In. This watch was above and beyond my expectations— “such elegance” was the first thing that immediately came to mind BEFORE I even opened the box that held the watch because it was covered with stitched LEATHER—the sides weren’t leather but the box itself was so sturdy that you couldn’t help but think it could made of wood..., even the parts to which the leather was stitched onto! 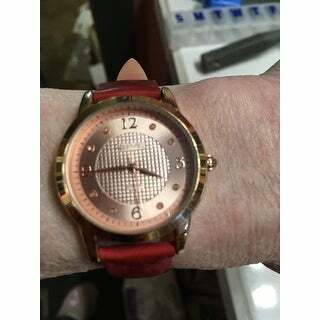 I was looking for a large, easy-to-read face without glare so I purchased the one with the red leather band—(a real plus since Red is my favorite color)and the rose toned gold with 2 tiny real diamonds between each of the 12, 3, and 9 numbers. The band fit my very tiny wrist perfectly—(regardless of what type of band [stretch, leather, fabric, etc. ], this was the 1st time a band fit without altering it)! Also, the back was stainless steel and “Water Resistant 3ATM OR 30M (100 Feet)” and defined as “Suitable for showering or swimming in shallow water” —another unexpected plus! Now, for the FREE-gift-part of my review—I should mention that “free gifts with a purchase” are rarely worth mentioning and are usually garbage. However, this was, without a doubt, one of those rare exceptions and it was exactly what I was originally searching for!! It too, is a “designer” watch (I think? )—“AKRIBOS XXIV.” It instantly became my ‘go-to’ everyday watch..., it has a larger, easy-to- read face (probably Unisex) with a black leather band (that needed 1 additional hole because it was just a tiny bit too big), with a stainless steel back, but without the ‘bling, or fancy shmancy features of the other watch (the “TomBoy” in me will never change😏). They both keep perfect time. I will ATTEMPT to include a few photos here. Ordered this watch with White/Gray received Gold/Tan returned it after calling Customer Support. Reordered White/Gray and again received Gold/Tan called again and told to return it. Returned it for the second time. Received statement from Overstock and was charged for the first watch without return noted. Received an E-Mail stating to just keep the watch due to the issues that I had regarding the watch. One more time called Customer Service and sent them the E-Mail stating to keep the watch. Had to resend the E-Mail SIX TIMES before it was received by Customer Service. Then, I was told by Customer Service that they could not send me a free watch. I had NOT asked for a free watch. Each time that I returned the wrong watch, I did it immediately after receiving it. So much for purchasing from Overstock. I love this watch! August Steiner is a prized watch that will last forever. I work hard - a lot of construction/landscaping and I have to wear it everyday. It has survived a beating. I never take it off and it looks elegant as well! Love this watch. The band is real soft leather. I like a strap because my wrist is hard to fit . I love the rose gold, it matches my ring and very pretty and easy to read. This August Stiner watch is the perfect casual look and is even better detailed with the diamond numbers than it appears in the picture. Love it, love it. The watch has a comfortable fit with a soft leather strap. It is a perfect gift for anyone and is great for everyday use or even just a fun night out. not as good quality as I hoped. You get what you pay for! The leather strap was cheap looking and the size did not work for me. I did like the gold and black colors together. Based on photos, I thought this was a gold and black watch. Instead, it's a very deep copper color, darker than a penny. The "leather" strap feels more like suede. Not very durable looking or feeling. The strap and dial are also a lot smaller that expected. I'm returning it. I absolutely love my new watch! It looks smashing with the rose gold and the black band. Very comfortable,easy to read. Looks great with any outfit ,whether casual or dressier.Many compliments received from friends.I am not usually a watch wearer ,but have worn it everyday since receiving it.would highly recommend it . My watch arrived promptly and was packaged quite wel it has a really nice case if I wish to store it.it looks exactly As pictured and is very comfortable on my arm. I like it a lot. I found the perfect watch for myself and didn’t have to beggar myself to purchase it. Really attractive. I am happy. I love this watch! 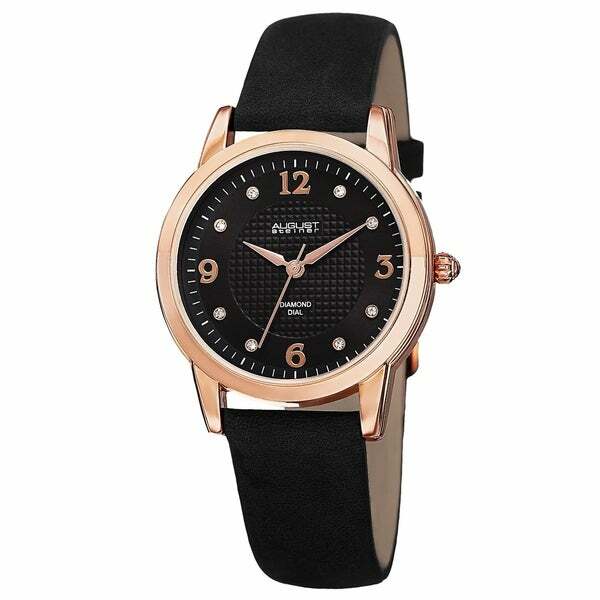 Women, you all need a little black watch, you know you do. It goes with everything from blue jeans and boots to that very special little black dress. The date and time are easy to read and it fits so comfortably. I am definitely happy with this choice. Get this one Easy to read Rich looking Band is very comfortable Classy!!! I absolutely love this watch ! I like the band as it's very comfortable and the rose gold is an added touch that I really like . If this one stops working , I will absolutely be buying another one . Might even get a few in different colors for gifts . Good job on this product Overstock ! Nice dressy look for work and comfortable. Came in a timely manner and packaged very professionally. The watch looks exactly like the picture, would recommend!! The face of the watch is attractive and expensive looking. The leather band has a dull finish which looks plain and is disappointing because the grey color advertised is more tan than grey. I do love this watch,as it is classy and different. On the other hand, the very things I like, which are the black face and rose gold hands, are also difficult to read. Overall, I’m glad to have this piece..
My wife just loved this watch. And shipping was very fast. Great watch easy to read and very comfortable ! Will buy more for gifts! "ITS THE CASE REALLY 42MM WIDE OR SMALLER?" Classic style and was in the market for a watch with a black leather band. Looks like a fantastic price for this watch.